There is something about music that I find very calming. The different pitches and tones create sound waves that fill up my ears and relax my soul. Nothing satisfies me more than finding a new tune. It’s the adult version of finding where your Mom hides the cookies. The cookies taste so good and even though you know that the more you take the more likely you are to get caught. You still keep going back. But, what happens when the music stops? You have emptied the musical cookie jar. While you have collected a solid library of tunes, your heart still longs for the call of an unfamiliar suitor. For the past year I have been stuck in a musical lull. I would often rely on friends or the radio to find new music. But, I came to realize two things. 1. People are very passionate and shy about their music. While some people can’t wait to tell you about how wicked Miley Cyrus is. Others find listening to music to be a private experience and are often shy to have their favourite music subjected to opinion (especially if it is Miley Cyrus). 2. As much as I love the radio. I find that Canadian radio, structured under CRTC guidelines, is forced to focus on making percentage quotas rather than sharing the best possible product to audiences. Where does this leave me? I’ll tell you where. Stranded and alone walking down a two lane highway with no on ramps for new life, invention, or expression. That is until I saw a tiny road sign in the distance. 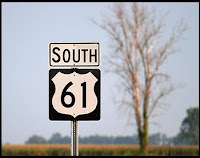 As I grew closure I realized that there were two numbers written on the front that read “61”. During one of my stumbles through the Internet I came across a website that is designed to promote bands and their music. It’s thesixtyone. Just when I thought I would never find anything new to peak my interest again. The musical spirits-that-be came down and showed me the way. I have found my stride walking down the 61. This 61 site is a pretty good idea, like you and the commenter before me I can't stand the radio. Even satellite radio, the few times I've sampled it, I was unable to find anything new that was of any interest. This looks really promising, all hail Sean.